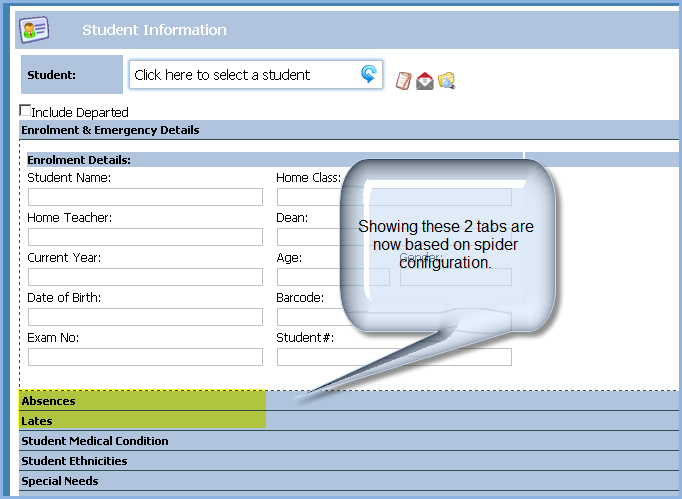 PCSchool has added the ability to hide or show the students Absence and Lates tabs in the Student Information view for various users: teachers, caregivers or students. This can be done using special keys in the Spider Configuration File. If its just for teachers, put only T in this value. This entry was posted in Attendance, Behaviour & Attendance, Caregivers, Security, Spider and tagged pcschool, school administration software, School Administration System, School Management Software, School Management System, school software, Spider Attendance, Student Information System, Student Information View, student management Software, Student Management System, web config file, web spider by studentmanagementsoftware. Bookmark the permalink.